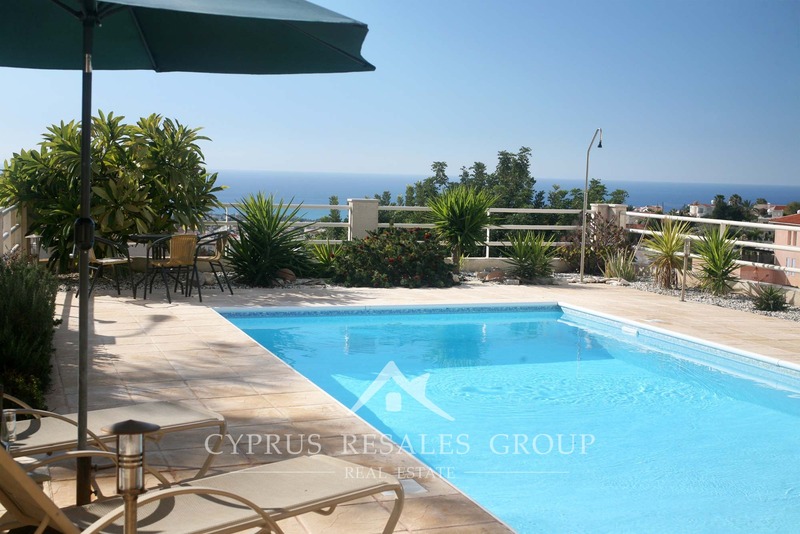 3 Bedroom villa in Peyia, Paphos Cyprus for sale with title deeds. 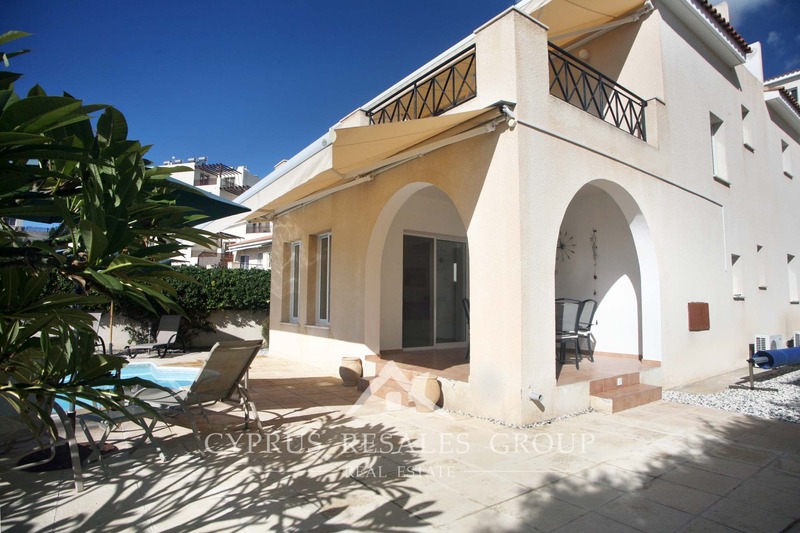 Here is a lovely Peyia residence with more than a dash of Mediterranean style and panache. 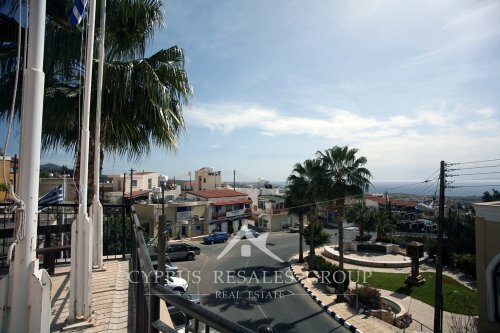 Conveniently located on a quiet road in the very popular coastal village of Peyia this property offers you amazing coastal vista with views over the new Paphos marina that is due to start construction soon. 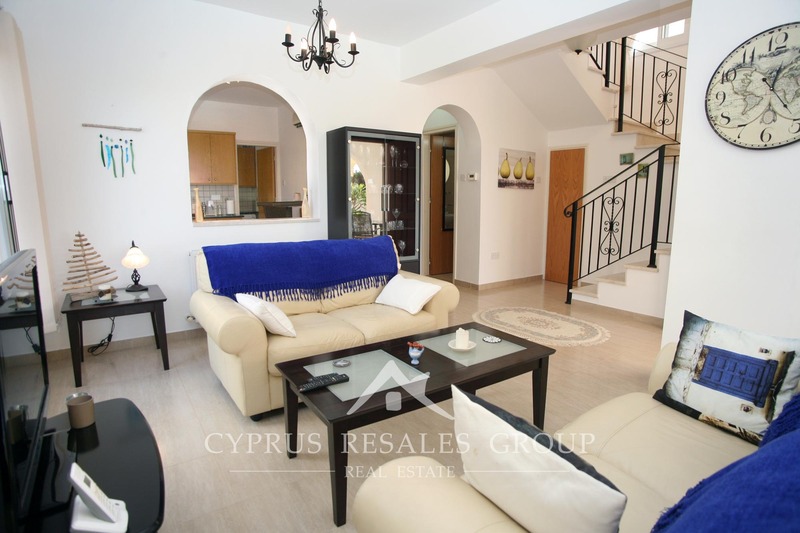 The village of Peyia itself has great pull with international buyers and its easy to see why. 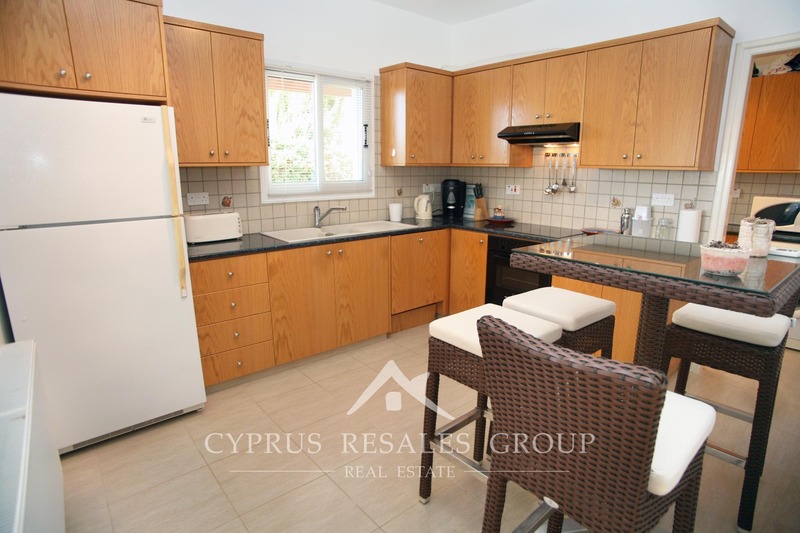 Peyia has all the facilities you could ask for – from hyper-markets to traditional Cypriot taverns and don’t forget Coral Bay, which boasts some of the best beaches on the west coast of Cyprus. 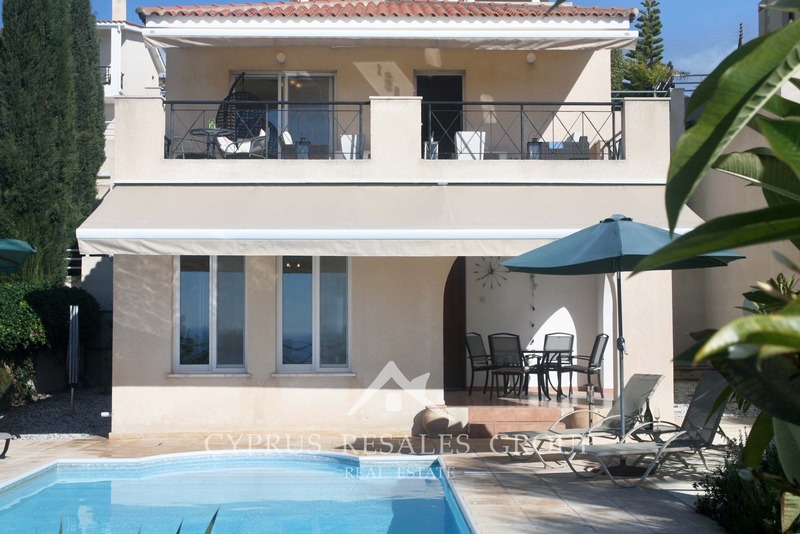 Being nicely elevated from the peaceful road this villa boasts exceptional sea views. 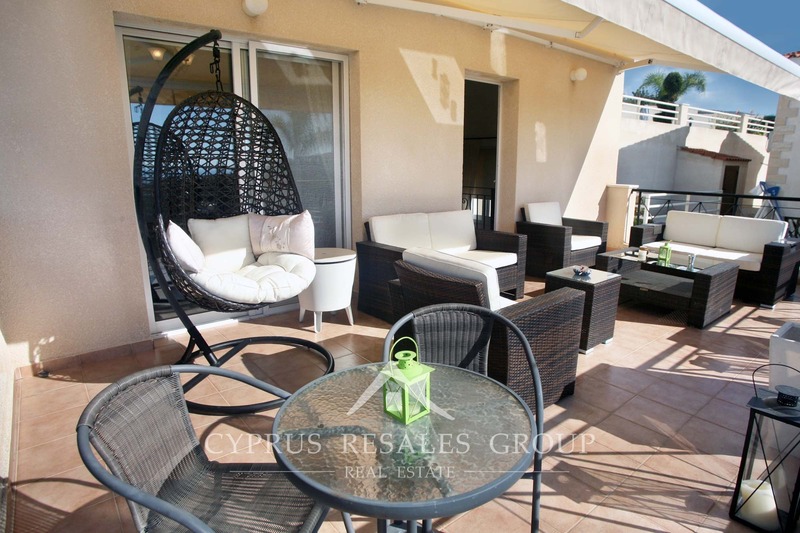 With outdoor space in Cyprus being the main attraction you will be pleasantly surprised by spacious terraces and beautifully landscaped low maintenance gardens. 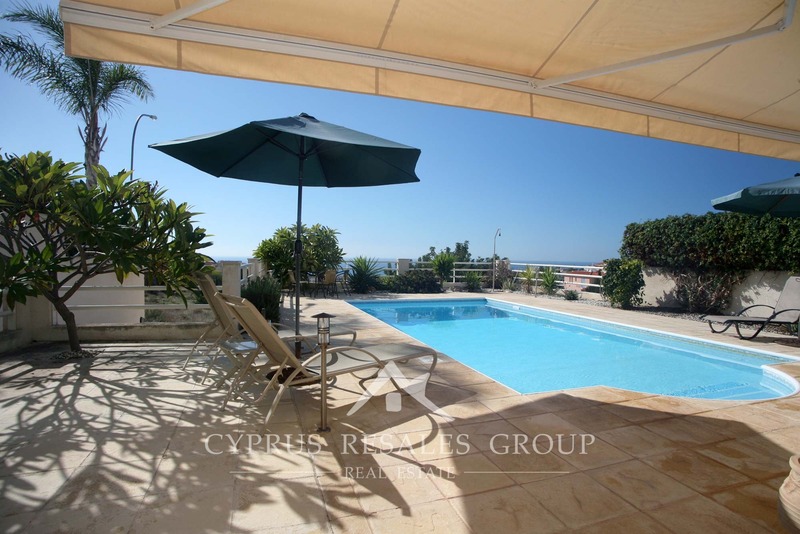 But it is the large 10 x 4 meter heated swimming pool with Roman steps that takes center stage. 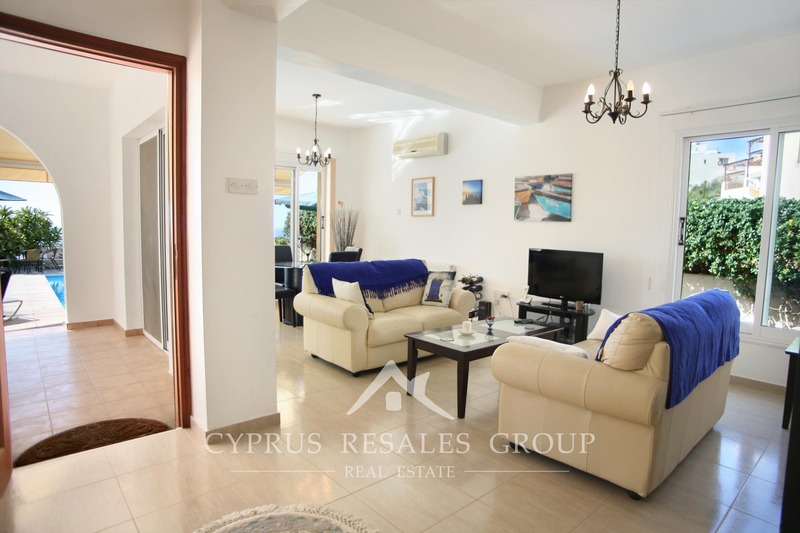 Perfectly equipped for outdoor recreation and entertaining this lovely home will present you with a wonderful time. 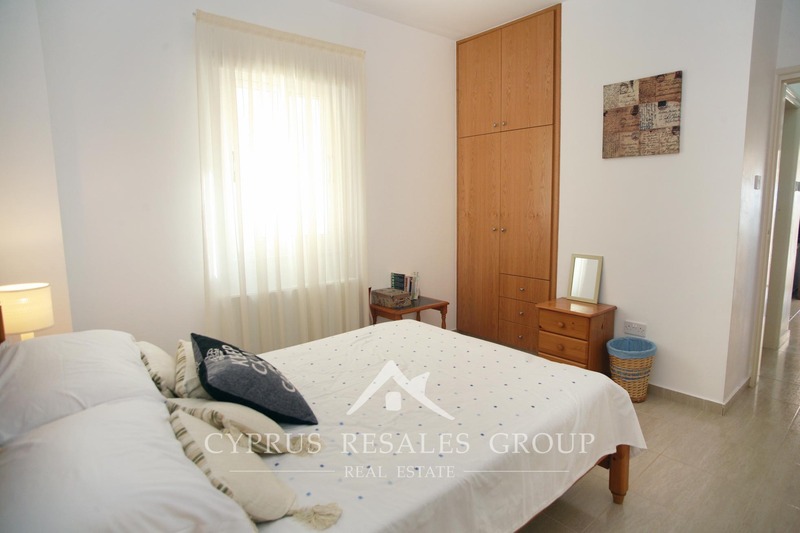 Indoors this villa is happy to pamper its owners 365 days a year with FULL CENTRAL HEATING making this a warm and welcoming property even during the short Cypriot winter. 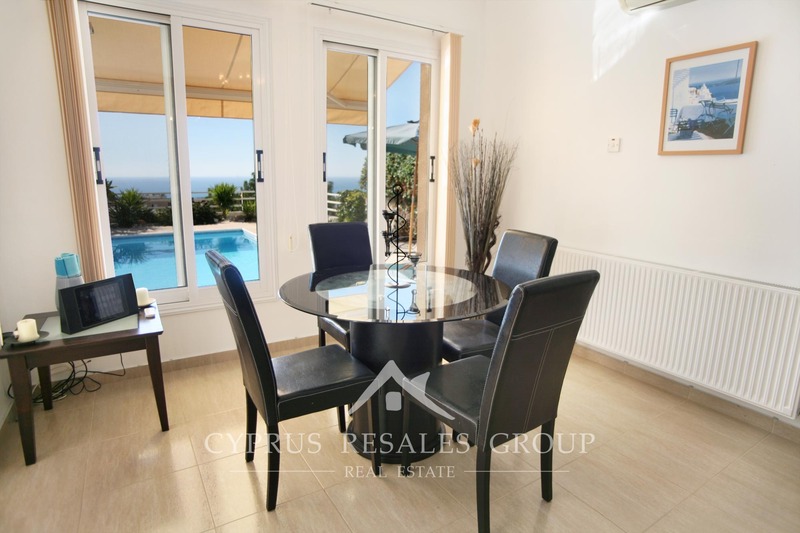 The living room benefits wide patio doors that overlook the swimming pool with the deep blue Mediterranean and bright skies beyond serving as constant reminder that you now live in the South. 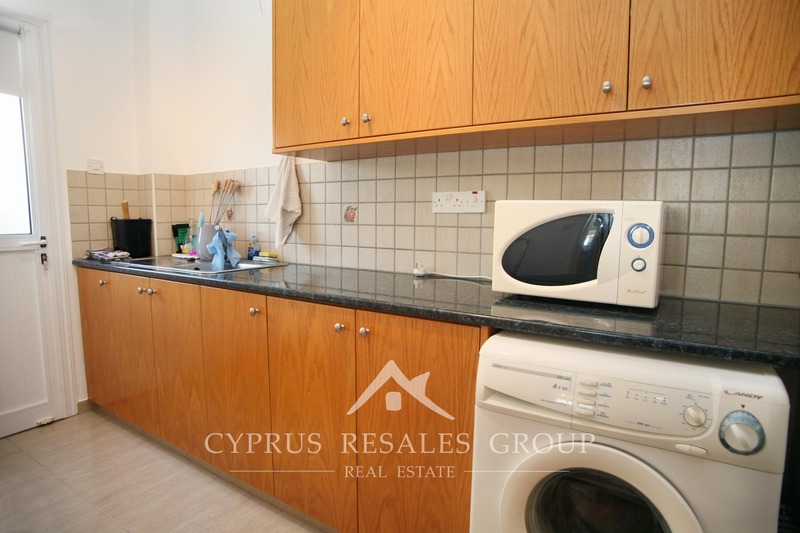 The spacious kitchen with adjacent utility room is linked with the lounge by an elegant arch. 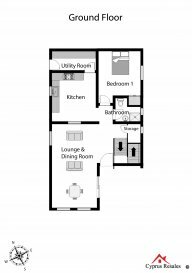 At the back of the ground floor we find a well proportioned guest bedroom and a shower room. 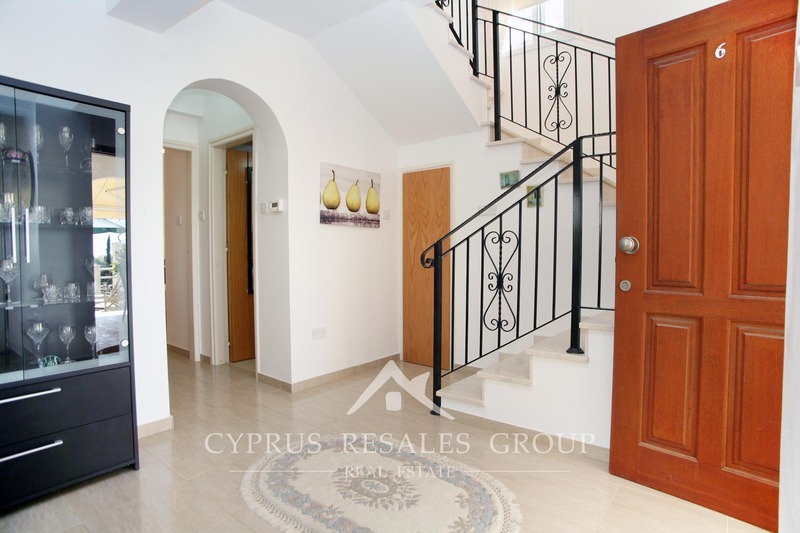 Marble stairs take us to the first floor with further two bedrooms, both with en-suite bathrooms and ample fitted wardrobes. 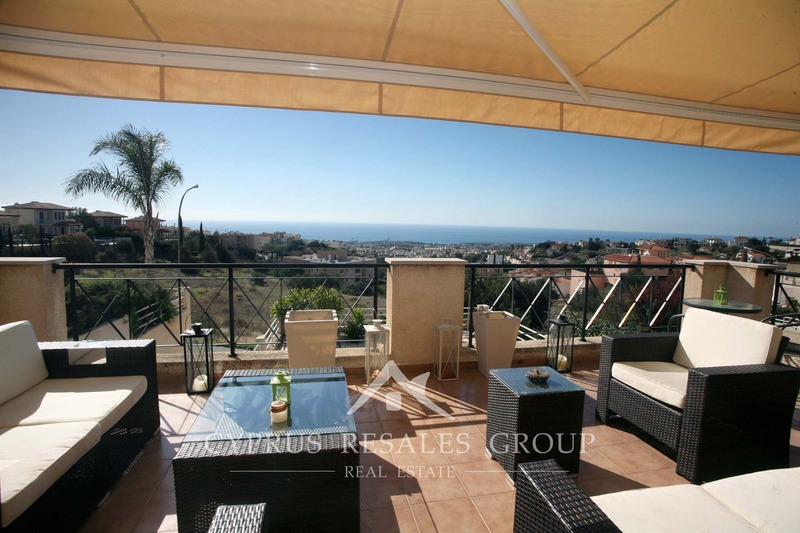 Accessed from the hall is an incredibly large terrace with most spectacular sea views. Electric awning give you lovely shade with only a press of a button. 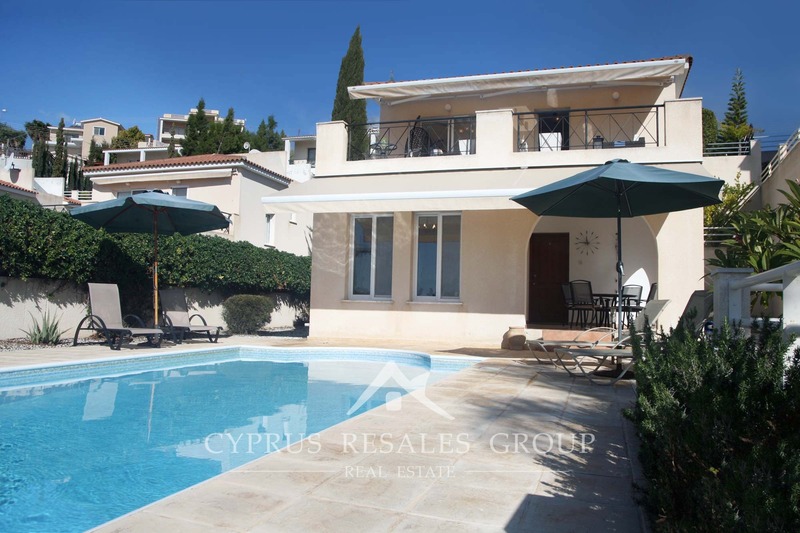 This villa will spoil you for choice – both the ground level and the first floor are perfectly equipped for out door recreation and entertaining. Take your pick and have a wonderful time. 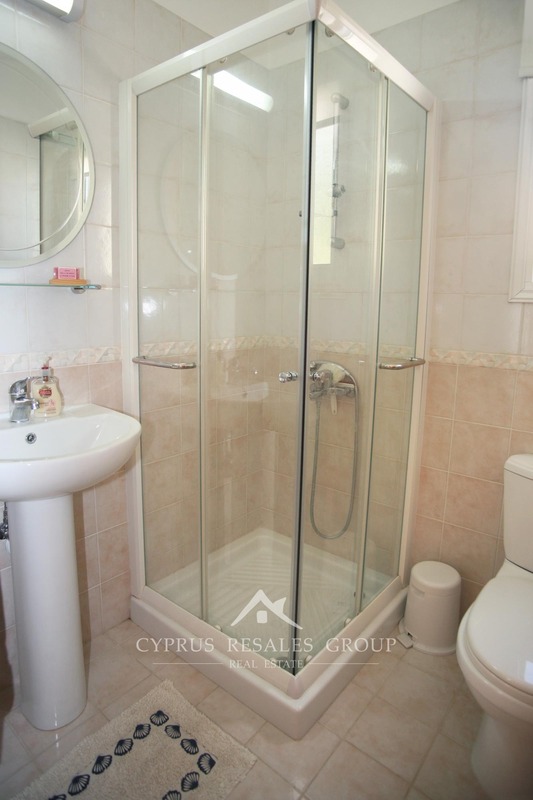 This is indeed a rare find with lots of extras and a great proposition for those with large families. 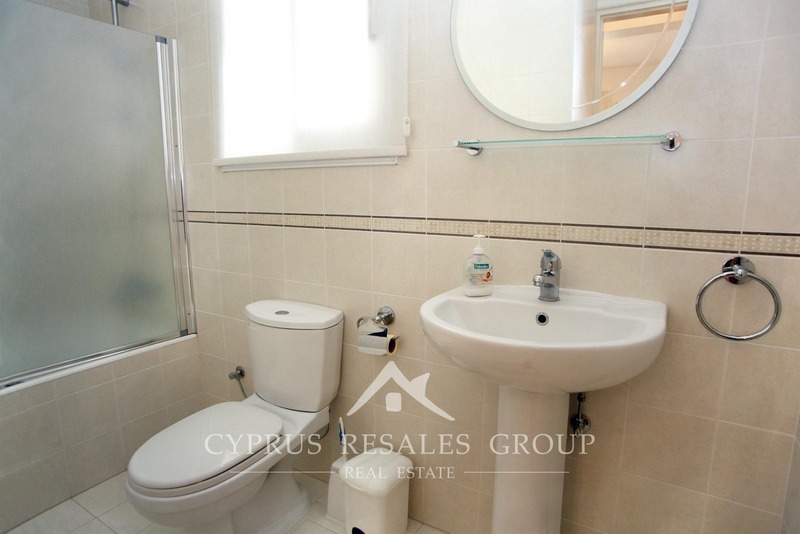 FULL TITLE DEEDS as you’d expect from the leading Paphos estate agents. 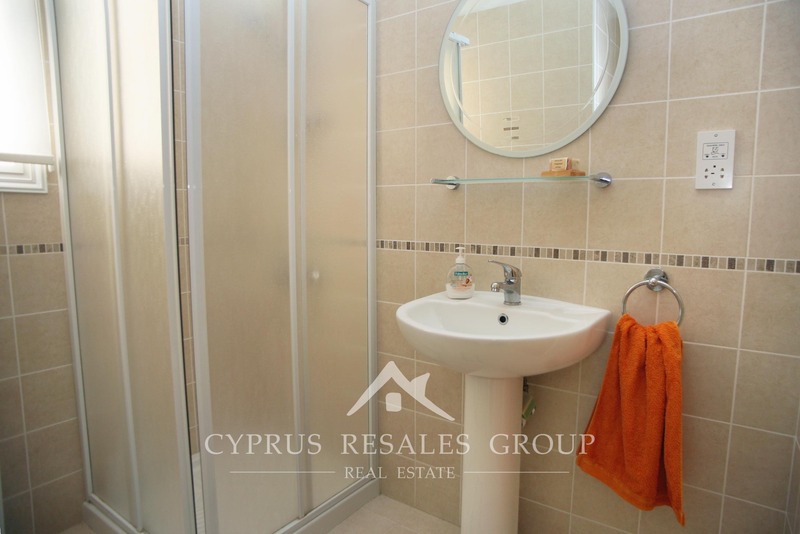 We deliver what you deserve at a realistic price.